Back in late August I was in Bristol for a meeting. So I took the opportunity of visiting a few Marilyns in north Somerset, west Gloucestershire and Herefordshire. The forecast was promising but the reality did not quite turn out that way. Ah well, never mind! My meeting finished at around 3.30pm and so I battled my way out through the Bristol traffic to Dundry Down. This is the first high ground to the south of Bristol. I reckoned that I must have been up on this hill when I lived in Bristol, but I could not be sure. So a visit was called for. There is a small car park near the church in Dundry village. The view is actually not bad out over Bristol but is was a bit hazy when I was there. I could see the city spread out before me, including the Clifton Suspension Bridge and my location on many a Saturday afternoon after school games at Failand, Ashton Gate. In the good old days I could get into Bristol City matches for half time. Gates were opened then and I could access the terraces for free. This seemed to be tolerated. So I saw the second half of many a game. Anyway, back to the matter in hand. There is a public bridleway by the car park that leads towards some communications towers. There is a split in the path and the less obvious route up to the tower is taken. One then passes through a gate into the fringes of a farmyard and then immediately turns right. This must be one of the most unsightly summits in the UK with farm detritus spread everywhere and weeds and nettles aplenty. The top is a trig point on what looks to be a heap of spoil. I did not spend much time there. Technically one is trespassing at this point. Just enough time to get a photo and I was off. Next up was Beacon Batch. 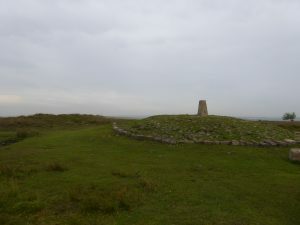 This is the highest point in the Mendip Hills and is located not far from Bristol airport. I was hoping to get good views over the Bristol Channel but the murk was closing in. I parked on the B3134 near Ellick Farm and followed the bridleway south and uphill. 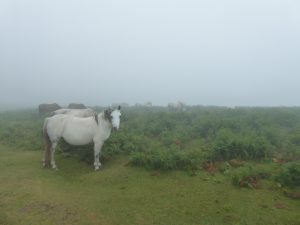 You are on to open common land quite soon and there is a network of official and unofficial trails through the heather. 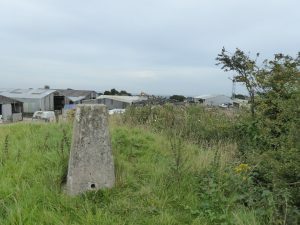 The summit is a trig point on a mound and the summit area is riddled with tumuli. 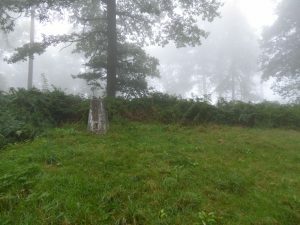 The summit is an ancient monument, though this does not seem to be respected by mountain bike riders given the scars they have left. The clouds were drawing in. It was as well that I was quickly down because it began to rain almost as soon as I was back at the car. Now I had a bit of a drive north to the Forest of Dean. I stayed in a B&B at Upper Lydbrook. My drive took me past a few other sights from my youth – the original Severn Bridge, the Wye Valley and Tintern Abbey. I got myself a pasty and chips and planned the next day’s climbs. “Climb” is somewhat of a misnomer for this hill. 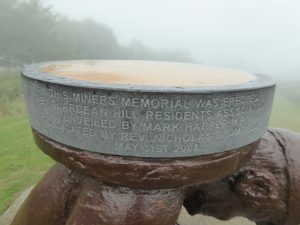 I am sure that views could be had from it, but the fog was down and I drove to within 20 metres of the top. 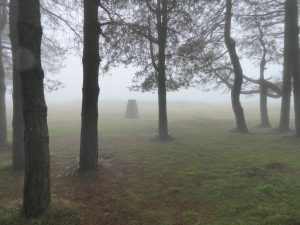 It is the highest point in the Forest of Dean. 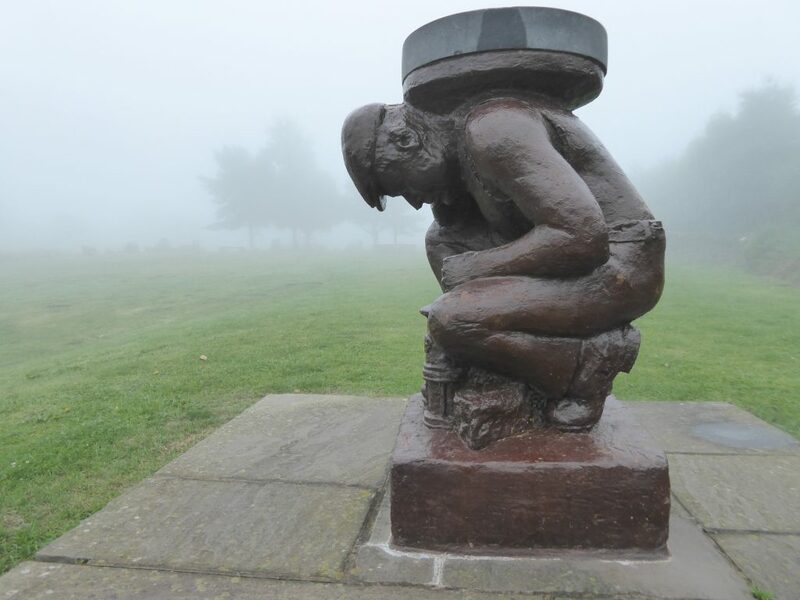 But much more interest can be found 400m away where there is a beacon and a sculpture celebrating the miners of the mining industry that used to thrive in the area. 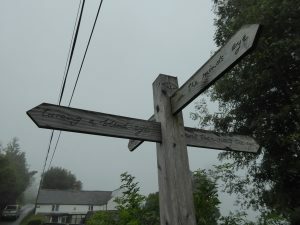 Next it was a short drive to May Hill on the boundary between Gloucestershire and Herefordshire. The property is owned by the National Trust. Again it was to be an ascent in the mist. I found a spot to park just outside May Hill village and followed a bridlepath WNW and then north west. The top soon came. There is a bit of woodland on the large flat top. Being a bit of an anorak I knew that the true top was not the trig point, but rather a little bump within that woodland. So, of course, I went there! There wasn’t much else to see other than a couple of dog walkers. So it was off to Marilyn number three for the day. Garway Hill sits above Garway village in the depths of Herefordshire. The upper areas are common land. 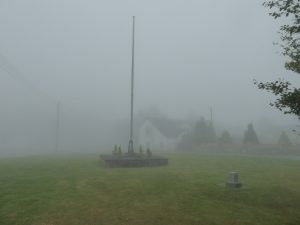 You are supposed to be able to see seven counties from its top. I was lucky to see just the one! 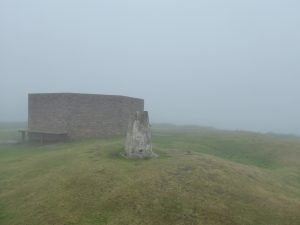 On the top are the remains of a second world war sighting station. There are a few bumps of similar height in the vicinity – so choose your top. It is possible to drive up a rough road to a small car park adjacent to the edge of the common. But as this road did not look as though it was a public one I parked on the verge at its end. After snooping around the concrete remains I descended. The local ponies gave some brief curious looks as I went by. Near where I had parked there was an equally curious sign post, perhaps reflecting the locals’ sense of humour. Marilyn number four is just off the A46 just south of Hereford. It is land owned by the Duchy of Cornwall and public access is permitted. That is about as much as one can say about it. The paths are boggy and the top is in the midst of woodland, so there would have been no view even if it had been the sunniest day ever. I had parked by the chapel on the road leading north east out of King’s Thorn. So it was off to my fifth and final Marilyn of the day. This is located between Hereford and Ledbury. It is a little difficult of access and the landowner has a bit of a GOML* approach to things. I also got a little lost trying to find a suitable start point. But at least I can now vouch for the fact that the countryside to south is very nice. I found a grass verge just to the north west of Woolhope Cockshoot (great name) to park on. A little up the road there is a public footpath that climbs up to the ridge line. From there is a track of sorts past a trig point (which is not the top) which track then climbs a little further into some woodland. Here I spent a good fifteen minutes, GPS in hand, trying to convince myself that I had found the highest ground by thrashing around in the thickest part of the woodland. Anyway, so far I am concerned, I did. There are supposed to be good views across to the Malvern Hills from here. Today you would not have known that they existed. So I quickly scurried off before any of the shooting interests detected my presence. And it was time to drive home. So seven Marilyns done and views from two of them. Ah well, what a bagger has to go through….